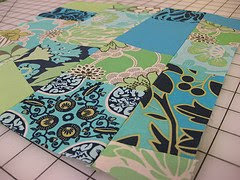 Columbus Modern Quilters: Sew-In on Saturday, March 12th! Come to Quilt Trends on Saturday March 12th to sew to your hearts content! Do you have a stack of fabric you've been just itching to cut into? Been wanting to make that set of potholders for ages now? Trying to get a jump on that spring top you swore you'd finish by June? Feel free to bring your own snacky-snacks and drinks too! See you on March 12th! Drat! I am going to have to miss this sew-in...I will be basking in the Florida sunshine with my family enjoying our spring break! I will hope to catch up with everyone at the March CMQG meeting.